India has successfully launched its Polar Satellite Launch Vehicle (PSLV) into space on 1st July, 2013 at 11:41pm. The launch vehicle was carrying a very important satellite IRNSS-1A, the first of seven planned dedicated navigational satellites into space. India is one of the handful countries in the world who have their own satellite launch vehicle and have executed 23 successful flights till date. The IRNSS-1A is a fully indigenously built navigation satellite having a life-span of 10 years. 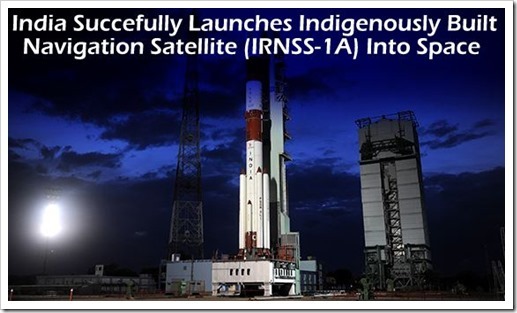 According to the ISRO press release, IRNSS is an independent regional navigation satellite system designed to provide position information in the Indian region and 1500 km around the Indian mainland. IRNSS would provide two types of services, namely, Standard Positioning Services (SPS) – provided to all users – and Restricted Services (RS) provided only to authorized users. ISRO plans to put 7 near-identical navigational satellites into space by end of 2015, by which time India is expected to have a a fully operational Satellite navigation system. Once all of them are operational India will not have to depend on others for any kind of Global Positioning system requirements. India is only the 6th country in the world after US (GNSS), Russia (GLONASS), Europe (GALILEO), China (COMPASS) and Japan (QZSS) to have their own navigation satellites in space. According to PTI report, ISRO Chairman K Radhakrishnan has said that in future he is looking for more participation from private players in India.